The Bunbury City Kart Club was formed on the 11th of June 1981 by five members, Vince Ciallella, Vince Marney, Bob Clayden, Terry Haskett and Vern Marney. The price of the club membership was set at seven dollars, The membership grew to a wopping one hundred and thirty five members in the first year. With the club formed, the next step was to build a race track, A ten acre site was chosen situated between the Bunbury City Speedway and the Shrubland Park Motocross track, An application to the City of Bunbury and the Lands Department for a lease on the site was accepted. The clearing of the land and the earthworks for the venue commenced on the 28th of Febuary 1982. The Bunbury City Kart track was originally built as a Dirt Kart track and later sealed with asphalt as club evolved. 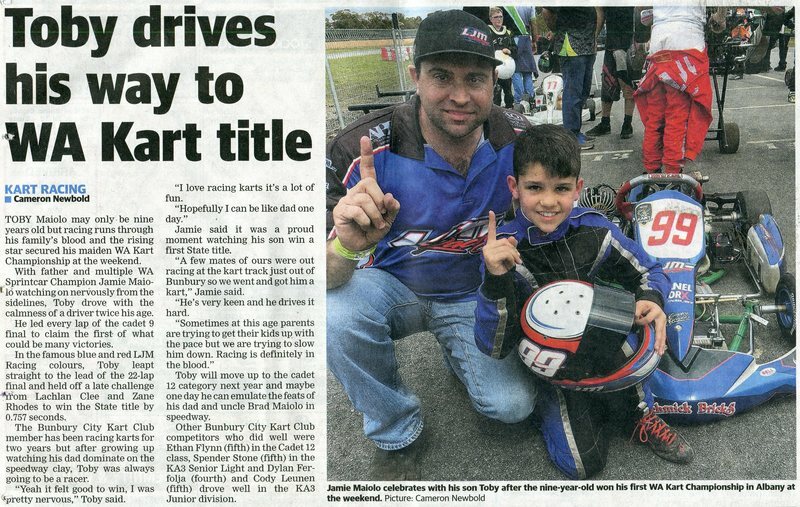 The Bunbury City Kart Club reported that on the 28th of Febuary 1992 Domenic Belcastro received a life time ban from the club and its venue for un-specified reasons. The Bunbury City Kart Club hosted open street racing events from 1993 through to 1995 in the central Bunbury taking in part of Blair Street and Stirling street, racing through a marked out section of the city's car park, before it was undercover, Cornwall street and back onto Blair street.